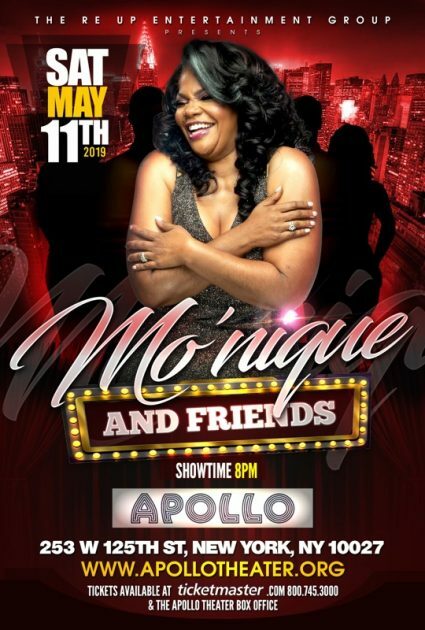 Academy Award winning superstar actress Mo’Nique is fresh off her historic Las Vegas residency to make her way back to NYC for her annual Mother’s Day show at the Apollo Theater. The multimedia powerhouse has once again joined The Re Up Entertainment Group to bring back her Monique & Friends show on May 11th at 8pm for one special night that is sure to be sold out. Now if you remember correctly, the Queen of Comedy’s must see show made headlines back in 2017 after her controversial remarks toward Oprah Winfrey , Tyler Perry & Lee Daniels went viral but this is exactly why you have to come to a show because you just never know what you’re in store for. The timeless comic is back for only one night in nyc so trust when i say this is one show you don’t want to miss. Tickets for the must see show are currently on sale starting at $68.50 and trust me this show will sell out like it it does every year, so get your tickets via TICKETMASTER NOW.